Planning on visiting the Mach loop? The Mach loop viewing points and guide will help you find the most popular viewing locations. The Corris Craft Centre is in the middle of the Mach Loop and provides a flat area for viewing the aircraft. They have a Mach Loop information area with details of the aircraft that fly over the Craft Centre and through the Mach Loop. There’s free all day parking, 9 craft studios, a café with outdoor seating (great viewing area) plus the King Arthur’s Labyrinth and Corris Mine Explorers underground attractions start here too. We often get request from those looking to visit the Mach Loop who are unable to climb the hills, so we thought it would be a good idea to show an example of a location that may suit their needs. Although you may not get the top-down view, it is still a great opportunity to experience military low level flying. 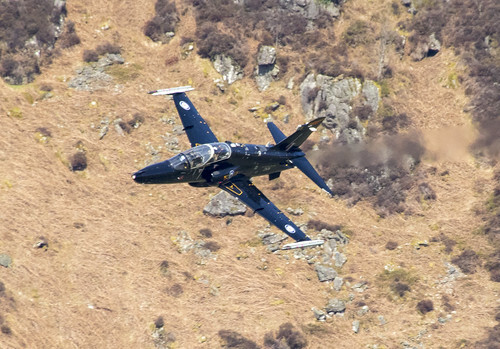 If you are planning to visit the mach loop and are wondering how to find it, we have compiled a list of the most popular viewing locations that include useful information such as lat/long, nearest post code and car parking. You can find the mach loop guides in the menu under ‘Viewing locations’. Photos taken from Mach Loop: Coming soon! Bwlch, in the Mach Loop, is a great location if you want a ‘topside’ or ‘level-pass’ view of aircraft. You also get a few seconds heads-up, as the aircraft approach from your right. This image above is intended purely as a rough guide to finding your way to Bwlch Middle and Top Ledge. The arrows provide you a general flow for the climb – be sure to take care and follow the safest route for you. Photos taken from Bwlch: Coming soon! Corris Corner, in the Mach Loop, is a great location if you want a ‘topside’ view of aircraft, passing from your right to left. This image above is intended purely as a rough guide to finding your way up Corris Corner. The arrows provide you a general flow for the climb – be sure to take care and follow the safest route for you. Special thanks to Mal Durbin for sharing some of his photos from Corris Corner. Photos taken from Corris Corner: Coming soon! If you would like to share your photographs taken from this location, please drop us an email to photos@machloop.co.uk. We will gladly provide acknowledgment and a link to your portfolio for any photos used.